Achilles tendonitis in an adult may present itself as Sever’s disease in children. Sever’s disease, a common heel injury in kids, is due to inflammation of the growth plate in the heel. A hip flexor strain in an adult may appear as an Anterior superior iliac spine (ASIS) avulsion injury in children. This condition is due to an excessive amount of muscle stretch across an open apophysis (growth plate) at the ASIS. Patella tendonitis in adults may appear in the adolescent population as Osgood-Schlatter disease. This disease is a common cause of knee pain in growing adolescents. It is an inflammation of the area just below the knee where the tendon from the kneecap (patellar tendon) attaches to the shinbone (tibia). The goal of Physical Therapy is to identify tight muscles and faulty body mechanics that are contributing to the abnormal strain on the tendon attachment site. 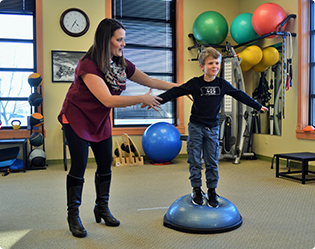 Once identified, a Physical Therapist may prescribe exercises, stretches, orthotics, braces, or activity modification and work with the patient to change faulty body mechanics to help alleviate the abnormal strain.